This is Part 9 of my China 2014 Photo Report series, you can see all previous Reports here. 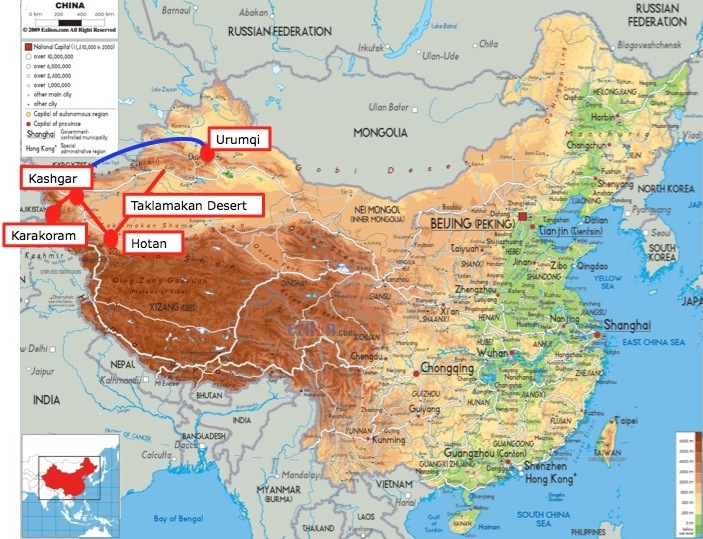 We are now heading 840km North-East from Hotan to Kuqa, still in the Xinjiang Uyghur Autonomous Region in Western China. 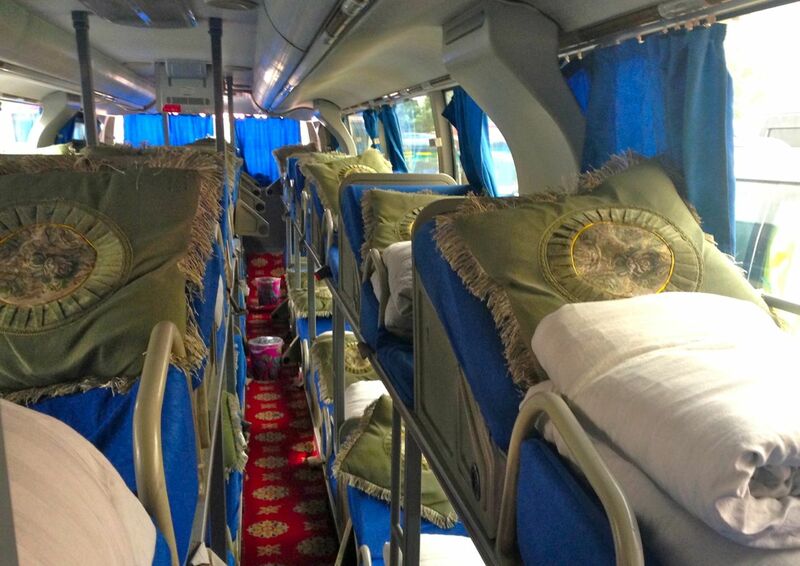 This leg of the trip is done by sleeper bus and the entire journey is spent crossing the Taklamakan Desert, the second largest sandy desert in the world after the Sahara! But first to get the right bus ticket. We are in a region where absolutely no one has any notion of English and a large majority of the population does not read Chinese script nor understands Mandarin, so my very sparse knowledge of the language is useless here. As such, what would be considered a mundane purchase can end up taking an entire morning! That’s adventure to you. This is where it’s all happenin’! Sometimes Chinese script was not even bothered with. 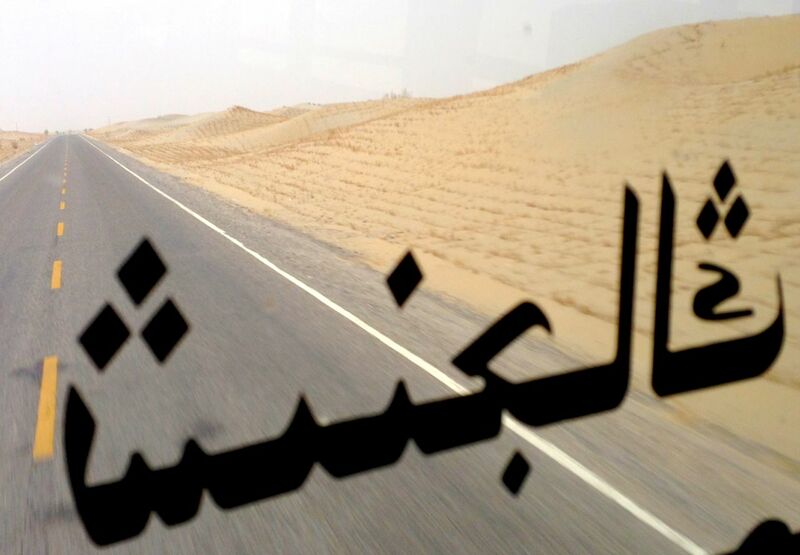 All was not lost fortunately, and I will ask you dear readers to join me in thanking beautiful granny with baby for swapping her berth at the very front of the bus with mine so I could admire the view and share with you this Taklamakan Desert Photo Report. One last interesting event on the trip before I go on to the cars was the Chinese officer at the first check-point asking me twice whether I was ‘Taliban’. (must.shave.tonight.) Wait what? An American Taliban? I’m lost. The tension dropped significantly when the word spread inside the bus that I was French. 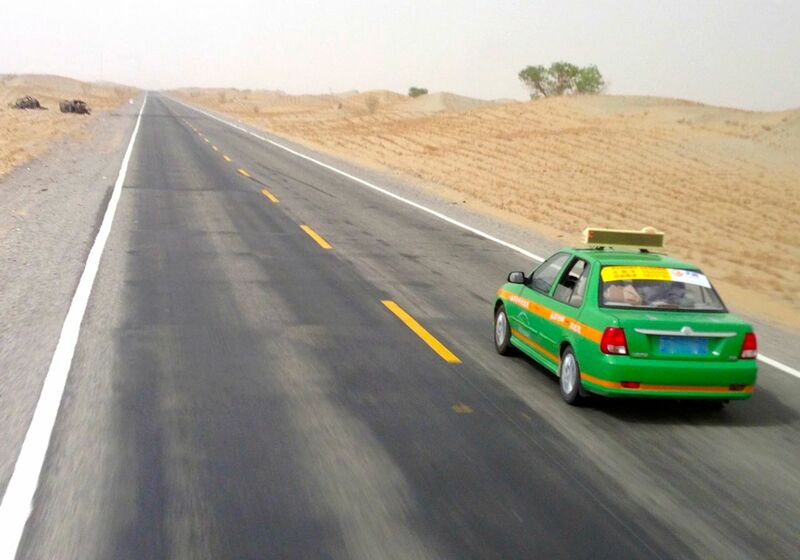 So what cars are travelling across this brand new Desert Highway? The (disappointing?) news is that all cars do, which in turn means pretty much all Chinese vehicles can withstand long desert trips, including the fragile-looking Chana and Wuling minibus and mini pickups. The highway is in excellent shape and freed from any sandy incursion by heavy protections on each side of the road keeping the sand in place. 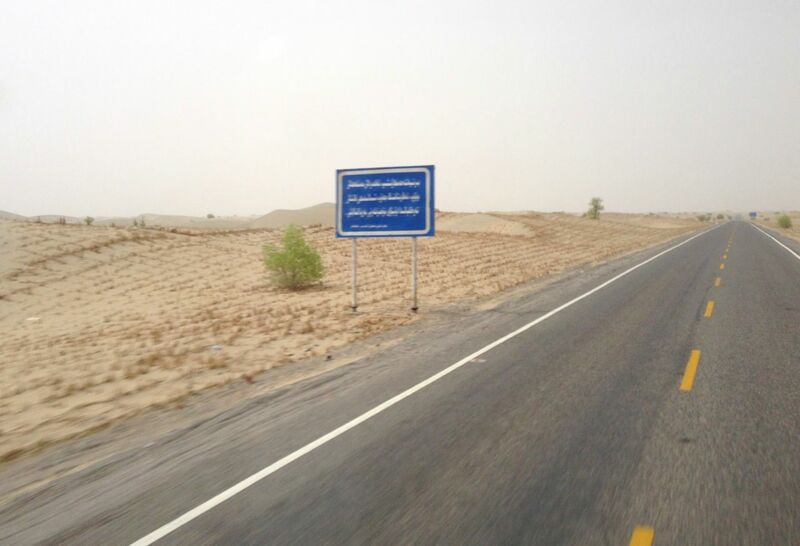 This also means the sand dunes visible from the road are not as ‘pure’ as I wished… Second striking observation was the presence of huge, very new-looking tractors in most tiny villages we passed in the desert, clearly far from missing out on the region’s fast development. 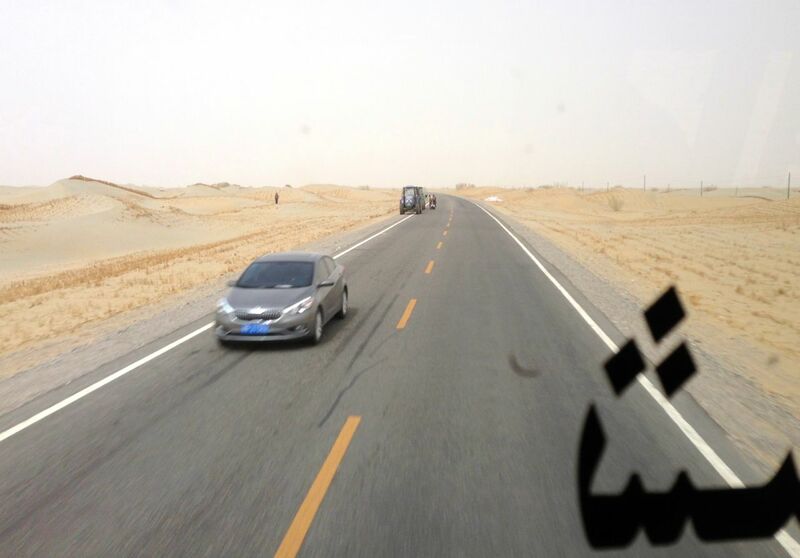 Some of the cars spotted more than once on the crossing include the now traditional Hyundai Mistra, Wuling Hongguang, Kia K3, Great Wall Haval H5 and H6, Toyota Corolla, Skoda Octavia, Honda CR-V, old gen VW Santana (the latter two being the most frequent vehicles in the Taklamakan Desert), Hawtai Santa Fe, first gen Citroen Elysée, Suzuki SX4, Great Wall Voleex C30, Shanghai Englon SC7, both generations Nissan Tiida, Mitsubishi Pajero and Landwind X8. I also spotted my first Chery QQme of the trip, right in the middle of the desert! Next stop: Kuqa… Stay tuned! I have enjoyed all the China reports, a fascinating country, so many different peoples and landscapes. Cheers Matt. What a Great Adventure! Have a nice trip, Matt! Hi Arthur – there are two drivers in each bus, when one drives, the other one rests on a berth in front of the bus – the berth I was trying to snap up! Ha.